Special Offer Shikara ride complementary for 1 hr. Special Gift from Nature View Tours & Travels – Honeymoon Cake, Room Decoration & Candle Light dinner in Houseboat Nights. Shikara ride complementary for 1 hr. Special Gift from Nature View Tours & Travels – Honeymoon Cake, Room Decoration & Candle Light dinner in Houseboat Nights.Any Air Fair / Train Fair / Helicopter Fair / Ship fare. Any additional Meal other than mention in above. Additional sightseeing or extra usage of vehicle direct paid by the Guest. Entry Tickets of Gardens and Parks. Any Insurance or any personal Expenses. Welcome to the Srinagar, The Lake City. On arrival at Srinagar Airport, being your tour of ‘Crown of Kashmir '. You will be transferred to Houseboat. Shikara Ride in Dal Lake. Overnight stay at the Houseboat. Early in the morning leave for Pahalgam the 'valley of shepherds' which is situated at the confluence of the streams flowing from river Lidder and Sheeshnag lake. On the way u can visit Zaffron fields, Bat Factory, Pandav Temple , Apple Garden. En route visit the Awantipura ruins, an 1100 year old temple dedicated to Lord Vishnu and built by King Awantivarman. On arrival into Pahalgam enjoy the surrounding beauty or walk to Baisaran, which is about 2 km from Pahalgam. A small village set in pine and fir forest is pleasing and offers good view. Once in the Pahalgam one can trek the mountain lakes, pony ride or drive to, plain meadows as suggested here under. ARU: This village resort is connected by 11 km upstream from the Lidder River, motorable road from Pahalgam. It is a base camp for trekking to the Kolhoi glacier & Tarsar Lake. It is popular among the tourists for its peaceful environment & scenic beauty. BETAB VALLEY: Famous for film shootings is a plain scenic spot amidst pine trees 3 kms on Chandanwari ,Base Camp for Annual Amarnath Yatra road. The valley got its name from the Sunny Deol - Amrita Singh hit debut film. BAISARAN: Often dubbed at ‘Mini Switzerland’ because of its long dark meadows resembling the once in Switzerland. This popular picnic spot 4 kms from Pahalgam has meadows, pine trees with streams flowing through it. SHIKARGAH: A wild life reserve at a close distance. MAMAL TEMPLE: An 11th. Century temple on the right bank of Lidder has a Shivlinga with a spring rising from there. Night halt at Hotel in Pahalgam. After having breakfast, Drive to Srinagar. Local sightseeing of Srinagar, Proceed on a city tour visiting the SHANKARACHARYA TEMPLE situated on the highest hill of Srinagar, the famous Mughal Gardens (Closed on Friday). Also known as Jyestheshwara Temple or Pas Pahar by Buddhist, is situated on the top of the shankaracharya hill of the sulaiman hill in the zaberwan mountain in srinagar. It is dedicated to Lord Shiva, the temple is on the summit of the same name at a height of 1000 ft above the plain and overlooks the city of Srinagar. The temple dates back to 200 BC, although the present structure probably dates back to the 9th century AD. It was visited by Adil Shankara. This is how the remple got the name Shankaracharya. There are 243 stairs to the temple. Also called “The Royal Spring “ is one of the mughal gardens around a spring by Ali Mardan, A governor of Mughal emperor Shah Jahan in 1632. The garden is located in Zabarwan Range near Raj Bhawan (Governor House) overlooking dal lake in srinagar Kashmir. Located at the bank of Dal Lake with the Zaberwan Mauntaina as its backdrops. Nishat baugh is a garden of bliss that commands a magnificent view of the lake beneath the snow cap pir panjaal mountain range that stands far away to the west of the valley. The baugh was designed & build in 1633 by Asif Khan, elder brother of Noor Jahan. 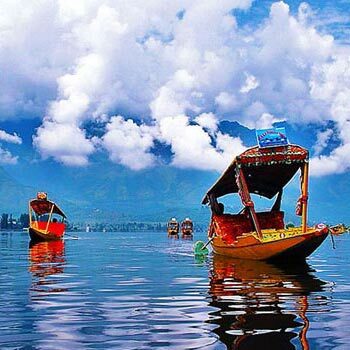 Shalimar baugh is located on the north east sideof dal lake approximately 15 kms away from the center of Srinagar. It was laid out by Jahangir as farah baksh (the delightful) in 1619, while he was founding the city of Srinagar. The baugh is considered the high point of mughal horticulture. It is now a public park. These gardens were Mughal Emperors concept of Paradise and today these are popular picnic spots. Also visit a handicraft shop where you can purchase local Hand Crafted items - Shawls, Jackets, Bed Covers, Paper Mache, Carpets & much more. In the evening leisurely stroll alongside the Dal Lake exploring the local markets. Night stay at Hotel. In the morning after having breakfast drive to Gulmarg, the‘Meadow of flowers’ a hill station, a popular skiing destination. The town is situated in Pir Panjal range in the western Himalayas. Gulmarg hosted the Britishers and Europeans and as such they created a European hill resort and named it Gulmarg. In Gulmarg you would be able to find European surroundings and 18 - hole Golf Course. Gulmerg has been one of the favorite sport for film shooting and hundreds of successful movies have been shot here. It has a Rani Temple, an old Saint Mary Church, a children park & a lake developed recently. Enjoy Gondola Cable Car Ride world’s highest and the Asia’s longest cable car (at your own cost). Enjoy photography, horse riding and shopping at this beautiful snow point. Return to Srinagar. Today you embark on a full day excursion to the picturesque'Meadow of Gold’ Sonamarg. Sonamerg an alpine valley is situated at the bank of Nallah Sindh, 87 km from North East Srinagar. In late April when Sonamerg is open for road transport, the visitors can have access to snow which is furnished all over like a white carpet. Sonamerg also known as ‘Gateway of LADAKH’. Amarnathji Yatra Also start from Baltal, 12 km from Sonamerg. The fast flowing Sindh river makes it popular for trout and mahseer fishing in summer. Ponies can be hired for the trip up to Thajwas Glacier a major attractive during the summer months for some fun in snow and ice. Return to the Hotel in Srinagar in the evening and enjoy comfortable overnight stay. Note: The vehicle will drop and pick you up at Sonmarg car stand. To reach the glaciers, you can hire ponies by your own payment basis. After having breakfast drive to Patnitop. Approx 187 kms / 6 to 7 hrs drive. On the way visit Nashree Tunnel. 13 kms long. After reaching at patnitop visit Naag Temple, Children Park, Pick N Spot Apple Garden, Circle Road, Natha Top. O/n at Patnitop. After having breakfast transfer to Jammu Railway Station to board your train with sweet memories of KASHMIR. Any Air Fair / Train Fair / Helicopter Fair / Ship fare.